Some change is coming to your spare change. The last set of quarters to be issued were part of the 50 States Quarter Program, which took up much of the first decade of the 21st century. Every several months, a new quarter would be released, featuring an iconic image having to do with each of the 50 states. It was considered a huge success and sparked a trend among amateur coin collectors to gather all 50 of the coins. Since the 50 States were such a hit, the U.S. Mint is trying its hand again at the collectible coin game with the America the Beautiful series. The line of coins, which will go on until 2021, will include national parks and monuments representing all 50 states, as well as Washington, D.C., and the U.S. territories, so there will be 56 coins to eventually collect in all. After the Hot Springs National Park quarter, we'll see a quarter paying tribute to Yellowstone National Park in Wyoming (that comes in June; it'll have Old Faithful on the "tails" side), Yosemite National Park in California (July), the Grand Canyon in Arizona (September), and Mount Hood National Forest in Oregon (in November). "Initial reaction has been very positive," says Donn Pearlman, who is the spokesman for the Professional Numismatists Guild as well as a long-time collector and author of books like Best Buy in Rare Coins: What Expert Dealers and Collectors Advise. 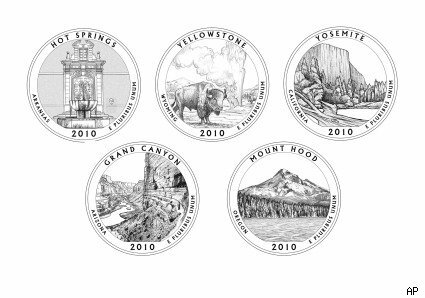 "Collectors remember the nationwide excitement about the State Quarters program." Pearlman was at the National Money Show in Fort Worth, Texas when I caught up with him on the phone. The show goes through Saturday and the U.S. Mint has a booth there, he says. "There are representatives happy to talk about the quarters, and people can see photographic enlargements of the five quarters being released this year," said Pearlmann. The great thing about the quarter program, Pearlman says, is that it shows that "you don't need a million dollars to be a coin collector. You can collect coins through your pocket change, and every coin has a story to tell." For collectors like Pearlman, the biggest thrill is the thrill of the hunt. If coin collectors go to the bank on April 19 and ask for the new quarter, the story about how they found it would be less interesting than if it, say, came from your winning from a slot machine or was given to you as change while you were on a first date with your future wife. Pearlmann says that he collected all fifty of the 50 States quarters by just shopping normally and poking through his spare change. "Some of them are more worn than others, but I'm proud of all of them." Believe it or not the process of minting a new line of coins is a long and complicated one. Congress legislates what the image on a new coin will be, not the U.S. Mint or Treasury as you would logically assume. "The governor gives us his preference of what he would like to see on the quarter, giving his top three or four sites," says Tom Jurkowsky, the director of public affairs at the U.S. Mint. "[T]hen the Mint looks at these lists, and we work with the Interior Department, the Fish and Wildlife Service and the Department of Agriculture to ensure that the sites meet the criteria of a national site and that they're appropriate, and that, 'Hey, we can actually depict this? Is the site discernible and iconic?' So once we make that selection, and we obviously try to go with the governor's first choice, we have artists render designs, and then we get comments back from the governors." After that, the Citizen Coinage Advisory Commission and the Commission of Fine Arts weighs in. Then the U.S. Mint decides on the image that will go on the coin, and then they make a recommendation to the Secretary of Treasury, who hopefully will sign off on it. "And then we're good to go," says Jurkowsky. Geoff Williams is a frequent contributor to WalletPop. He also is the co-author of the new book Living Well with Bad Credit.